Magna says its D-Optic lighting provides energy-efficiency benefits as well because LEDs are more efficient than other light sources, and they last longer. 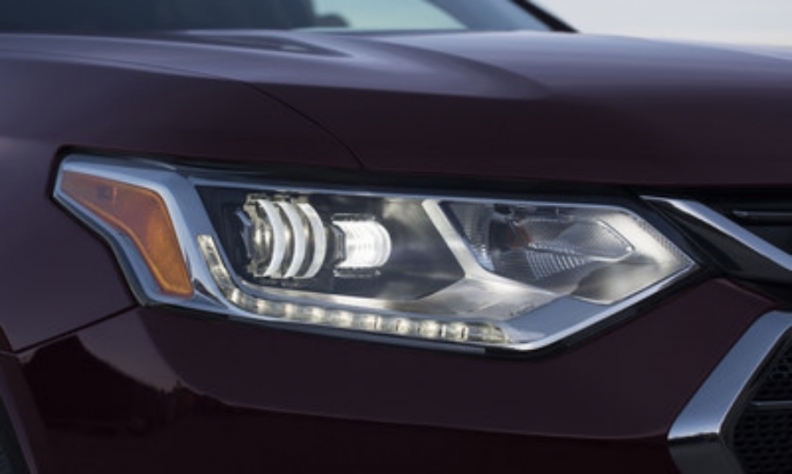 Canadian auto supplier Magna International says it has created a more efficient headlamp that can be custom developed for a vehicle's specific shape and styling, but also improves visibility for drivers. Magna says its D-Optic LED headlamps combine multiple high-power LEDs with precise, injection-molded lenses to achieve high performance with efficient energy use. LEDs and lenses can be added or subtracted to suit each vehicle’s unique design. The new headlamps make their market debut on the 2018 Chevrolet Traverse. The D-Optic lens consists of a single component and differs from a conventional headlamp optical system, which is a collection of multiple parts that require precision geometry and location. Magna says its D-Optic lighting provides energy-efficiency benefits as well because LEDs are more efficient than other light sources, and they last longer. In general, the company says the LED lights in D-Optic provide about 60 per cent energy-consumption improvement compared to halogen and a 40 per cent improvement compared to high-intensity discharge lights. D-Optic was developed and is manufactured by Magna at its new automotive lighting facility in Plymouth, Mich. About 300 employees work at the 140,000-square-foot (13,000-square-metre) product development and manufacturing plant, which makes headlamps, tail lamps and other lighting products. Magna’s announcement comes on the same day that a new study by the Insurance Institute for Highway Safety shows that only two midsize SUVs out of 37 were available with “good”-rated headlights. According to IIHS, most headlights in vehicles have one of three different light sources, which include halogen, high-intensity discharge (HID) or light-emitting diode (LED). One of these sources is then paired with either reflectors or projector lenses. Projector headlights use one lens to spread light while reflectors have multiple surfaces that bounce light forward. Engineers at IIHS measure how far light is projected from the low beams as well as high beams as the vehicle drives straight and around curves. Glare for oncoming vehicles is another factor to ensure that low beams aren't creating excessive glare.